Discussion in '9/11' started by Mick West, Jan 27, 2018. So, I assume you are saying that this thread convinced you that this particular piece of so called evidence for CD is not evidence of CD. Would I be correct to assume that if a fellow truther comes to metabunk and tries to argue that this diagonal cut is evidence for CD, you would help us explain to him that this is incorrect? I was agnostic regarding whether these columns bore evidence of attack by incendiary charges, and would dissuade anyone from basing their conclusions on them alone. I haven't read the above discussion, but I trust that it does show these were cut down conventionally. ... and other columns that you can see that have been cut during rescue... that have ben cut PRIOR, because this photos was taken during rescue operations, prior to cleanup. 1,2,3,4,5,6 cut columns you can see right here. This demonstrates a stunning lack of understanding of the World Trade Center site for someone who has spend so long heading an organization supposed focussed on the truth of the matter. This is clearly well into the cleanup process, some time in October. Gage's assertions here are nonsensical. And what evidence is that? You'll have to look that up yourself I'm afraid, as any mention I make will be removed as off topic. 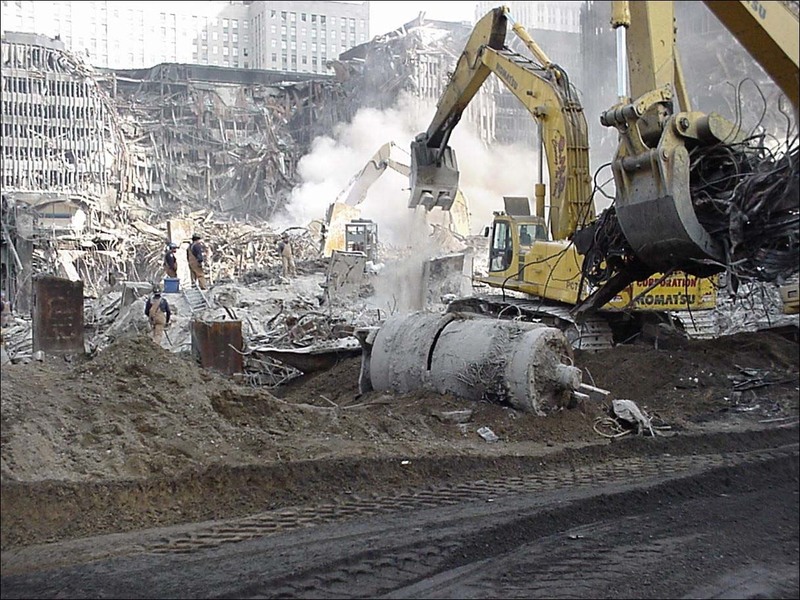 If it was not important why did AE911T and others use the column as an example of pre cutting for a controlled demolition? It's not important to me. One reason is why would we expect to see cuts to the perimeter columns at ground level? Might be more plausible to look for thermitic attack on core columns at the basement level. The column in question (and those around it) are core columns at the ground level. Based on the photographic evidence provided in this thread, they clearly were not pre-cut at the ground or basement level, right? I don't see what you mean. Are you asking me if I believe it was cut down in the aftermath? ...Might be more plausible to look for thermitic attack on core columns at the basement level. It seems to me you did not understand that the column at issue here (which was given an angle cut during the clean-up) and the columns in its immediate vicinity (which were also cut during clean-up) were core columns. He said he didn't read the thread. so he doesn't know where the cut column is. this shot shows to the left a bit more..so you can see the debris up against those candlestick things is gone. The photos are similar to these from November 8th, 2001. Two months after the collapse. And with perspective correction and blending. Again there's a fundamental misunderstanding on Gage's part here. How on earth he managed to characterize this photo as "during rescue operations, prior to cleanup" is baffling. Yes, I haven't followed the discussion so I'm sure you're right. But it might be better to look for evidence of thermitic attack in the basement levels was more my point there. Why? The columns sub-grade all appeared to be intact. 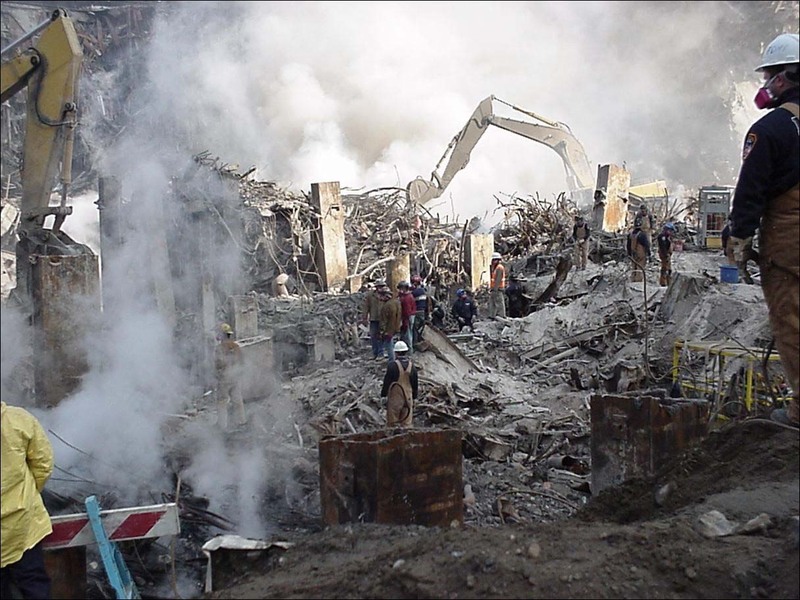 Were it possible to gain access to the remains of the twin towers, had they not been sold on the open market, I would look for evidence of incendiaries and/or explosives to corroborate the eyewitness testimony of a secondary explosion in the basement. Look at the photos in this thread. What would an explosion in the basement do? And what evidence would it leave. Why would this evidence not show up in site photos? Here's the basement, showing angle cut columns at around ground level. Everything is intact below that. And, as we have seen here, was largely intact ABOVE that for the core, for a few floors. Also answers some questions about where the concrete went. That's a bit obtuse. I was suggesting analysis ought to have been done on columns from the basement level - testing for residues, analysing deformation, looking for any changes in the grain, etc. I don't mean just casting your eyes over a few pictures and remarking that several columns survived. You mean like Richard Gage did? You agree his analysis here was pretty bad? I don't think he should have claimed the angle cuts demonstrated thermite, if that is what he did. I can see the appeal of giving AE a bloody nose, but these angle cuts are a soft target. Like going after the claim that jet fuel melted the steel beams, or 1 & 2 fell at 100% of free fall. You're not looking for evidence that might challenge your beliefs. This is silly. We challenged our beliefs in this thread by pouring over hundreds of photographs, any one of which could have contradicted them. I personally purchased over 10 books detailing, in narratives and photographs, the state of the wreckage at ground zero. You, on the other hand, won't even challenge your beliefs by reviewing just how flimsy Richard Gage's presentation has been for 10 years, even though the hard work has been done for you. Suddenly looking over three pages of thread is too much for you to possibly bear and be bothered with. You'd rather snipe at the work without even engaging with it, seemingly because you somehow knew we should have assumed ex ante that a key part of Richard Gage's public presentation for 10 years has been built on a fundamentally false claim that could be verifiably falsified with a few days of research. Why should we have assumed that, do you think? What made this claim in particular an easy target for debunking? Richard has been making it for ten years without ever hinting that he thought it was any flimsier than his other claims. Angle cut photos get hundreds of conspiracy hits on the internet. They are black and white proof of deceptive claims or at least proof of shoddy research. Claims of 'that squib doesn't look right to me' are subjective and , as you have demonstrated, the science is hard for some people to understand. So, it's claims like these - when not retracted by Truthers - aer what make most people stop blindly believing every conspiracy claim they see on youtube. You're not looking for evidence that might challenge your beliefs. I was very specifically looking at evidence that Richard Gage, the head of the largest and most influential 9/11 "Truth" organization, has used in his online course on 9/11 he gives to architects. It's also something he specifically called me out by name as being wrong about, and presented this column, the slag, and the irregular cut line, as evidence that proved me wrong. So should I simply ignore everything Gage says now? Would you recommend other Truthers do likewise? They are important enough for you to spend quite a bit of time trying to convince us they are not important. I did. or so I thought. or more the other way around. I was once a small-scale truther and penetrated my social enviroment with BS about 9/11. guess what challenged my belief? a long thread with a rational guy who just asked a few questions about the nonsensical nature of an "inside-job" of that scale and the extremly high odds of something going wrong in this "masterplan". I figured suddenly that I had nothing more than opinions, and those "evidence" I thought I knew, was just that; opinions, misinterpretation of pictures, videos and physics and the abillity to blend out what dindnt fit my frame of beliefs. admitting to myself that I would go so far to activly avoiding rational and logical thinking to justify those beliefs (mostly political ones, I guess) was a painful experience but worth it, cause I wanna know, not believe. Safe felling requires great care and precision. The directional notch determines the direction of fall, and you fell the tree with the felling cut. Left between these two cuts is the hinge, which directs the tree down to the ground towards the planned directional target in a safe way. I accept that's your perspective, but I don't agree. Richard Gage is functionally a science and engineering denier and his ignorance (mis)informs his beliefs and statements. He makes many demonstrably false statements in support of his CD thesis, yet refuses to acknowledge them and that his thesis collapses without these false statements as support. He has a disingenuous approach of being a person just posing questions. Others appear online with the same approach. However when those questions are answered he and others refuse to accept the answers because it again undermined this confirmation biased positions. As a result he will avoid interactions with engineers and scientists who show his beliefs are not grounded in science or engineering and chooses instead to lead the naive with all manner of logical fallacies including appeal to authority, something he is not qualified as. It's called judgement. Could you bring up angle cut columns in the pub and expect someone to believe that they indicate that Bush authorized a false flag attack on US soil? Wouldn't make any sense. Even if they had been cut with thermite, noone would follow. Showing them to be post-destruction artifacts is just a moment for you to enjoy, a 'gotcha' in the face of AE. Ah, judgment. So simple. So it's easy for you to judge this lie of Gage to be a whopper, but if you met Gage at the pub and he told you he and a team of fringe academics had found top secret, military-grade NANO THERMITE (cue ominous music) in the rubble dust (this crackshot team had all been too busy for 10 years to get such finding independently verified, but they promised they'd get around to it soon! ), then you'd figure it'd be time to rush off to the internet to tell people the government investigation couldn't be complete unless it searched for thermitic residue on columns in the basement of the towers? We're getting off topic, but, suffice to say, you should fiddle with your BS detector to see if you can get it stuck in the "on" position. It seems like it's inconsistent at best. It's interesting just how many photos of the site are not available online - either being just in books, or behind some paywall like the AP or Getty Images that only gives you a thumbnail. Oct 2, the pile around the "stump" of the WTC1 core is stripped away. Oct 11, the wider north core structure begins to emerge. Higher section have already been removed. The response I've had from at least one truther is that it's not the same column in the AP image. I find this rather baffling, as it's obviously the same. He's argued at quite some length on the issue. Here's all four known images of the column. that's why the slide photos are so nice. it's easy to see how all the other debris surrounding it is exactly the same. This is excellent and shows what length one needs to go to confirm or deny an assertion. The diagonal cut column appears in multiple photos from multiple views. And the face with the "T" and the the bottom curve of the white. Here I've skew the top and adjusted for perspective. The truth is even if he can't see that it is, in fact, the exact same column as the OP pic - this side by side clearly shows that "a" column after being cut can still be a diagonal cut with slag around the edge. Event he dirt smudges on the precut column match the dirt smudges on the cut column. Could you bring up angle cut columns in the pub and expect someone to believe that they indicate that Bush authorized a false flag attack on US soil? If I thought that the angle cut column was definitive proof of thermite and a False Flag Attack on American soil, authorized By Bush...Yes I would. But, when someone then showed me definitive proof that this was, in fact, proven, beyond a shadow of a doubt, that it was cut by clean up crews with a torch; then I would withdraw my statement, say that they were right and I was wrong, and then start looking for my next piece of hard "evidence" to throw into the argument. But I would acknowledge that I was wrong about the beam. I wouldn't just change my tune to "it doesn't matter". I already said I was agnostic on the angle cuts, and am happy to accept that they bear evidence of the cleanup process, not of attack by thermite. What statement should I withdraw? Look elsewhere for evidence of what happened that day. The third and fourth photos are so detailed and clear that it might be possible to figure out which columns remained standing in this group. This photo was taken on September 11 after some of the dust had settled. One can clearly see a substantial section of the northern or western wall of WTC1 was stripped off the building by the top block in almost a single piece, which is wholly inconsistent with any theory of controlled demolition that has been articulated by AE911Truth & Co. 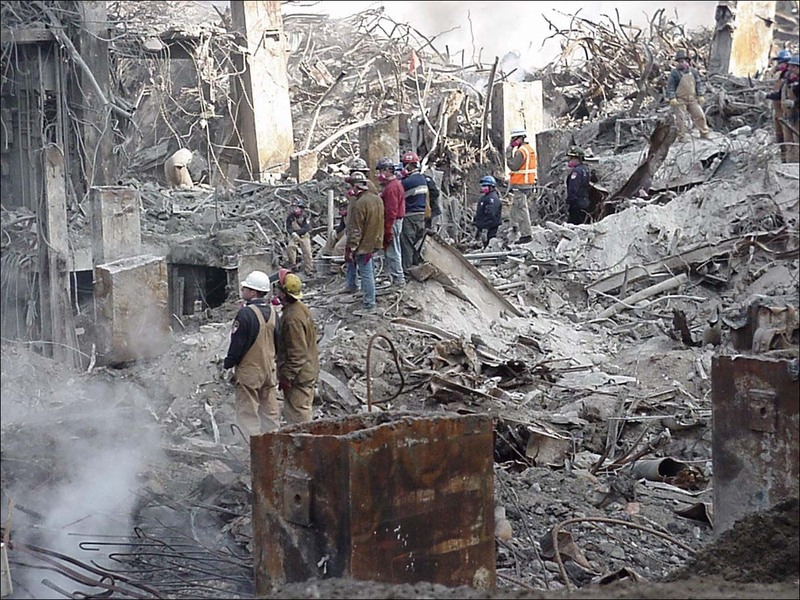 This section of debris is rarely seen in photos because this was one of the first sections cleared to facilitate an access road to Ground Zero. So we have evidence that a substantial section of the core was obviously not blown-up or otherwise destroyed by a controlled demolition and that a substantial section of the outer columns was not blown-up or otherwise destroyed by a controlled demolition. The circle of possibility for how a controlled demolition could have taken place and what its purpose would have been is tightening.